11 - Ship Manager : DILEK TRANSPORTING Inc 12 - Adresse : 1, Charilaou Tikoupi Street, Le Pirée Grèce. Les informations 1 à 14 sont extraites de la base de données Equasis. Elles sont à jour à la date de l’avarie objet de ce document. Les informations 15 à 20 sont extraites de sites internet en accès libre. 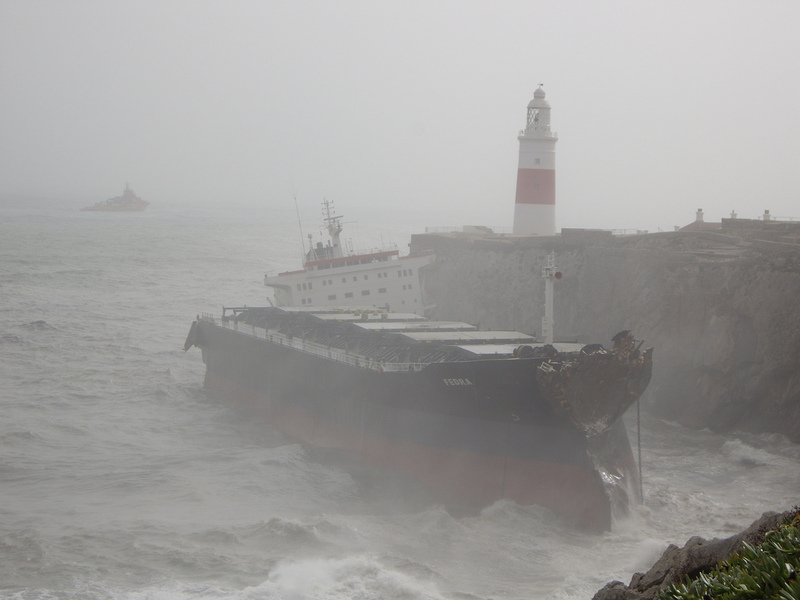 16.10.2008: A parellel investigation by the Gibraltar Police and Gibraltar Maritime Authority is currently underway. 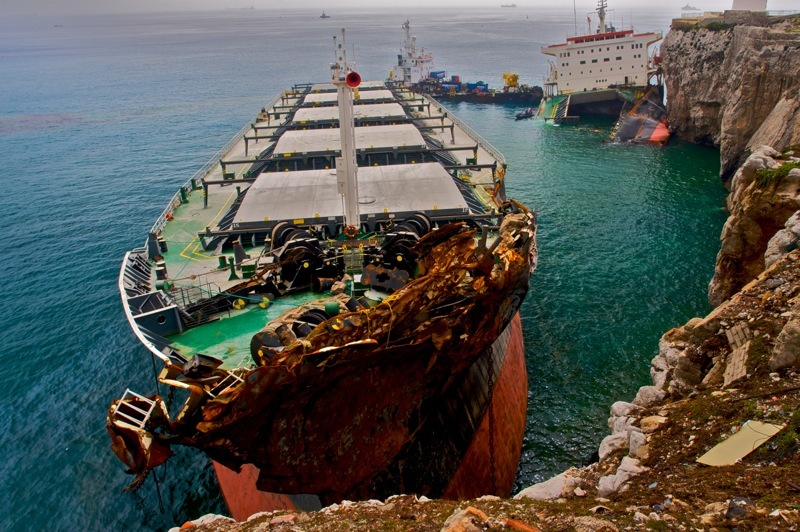 One area of focus for both investigations is the sequence of events that led to the vessel hitting the rocks. 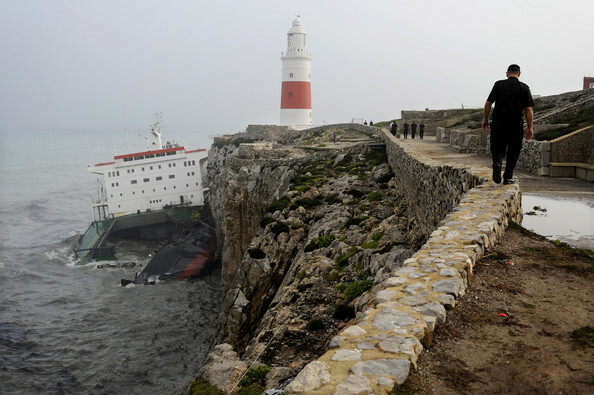 At Europa Point, marine surveyors climbed on board the wreck to assess the ship's condition and prepare a plan to remove it. 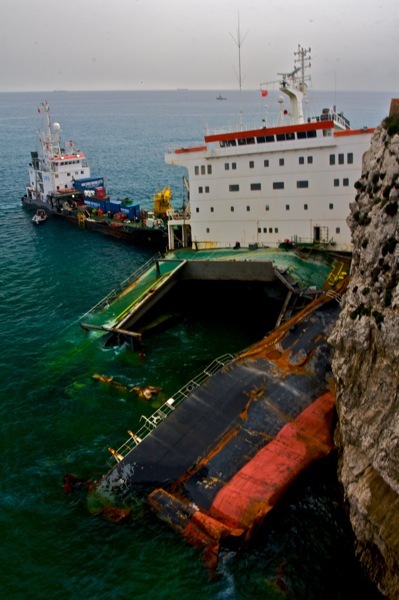 The bow section retains some buoyancy and may be towed away but the stern is resting on the seabed firmly wedged into the base of the cliff. 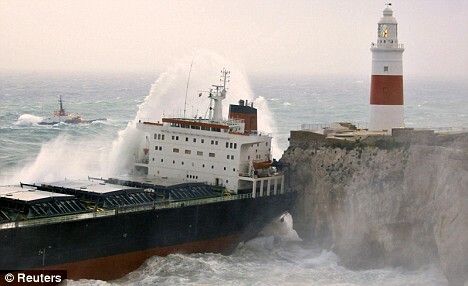 It was also reported that the oil slick from the vessel is threatening the survival of a colony of Shags on the rock, one of Gibraltar's most important sea birds. 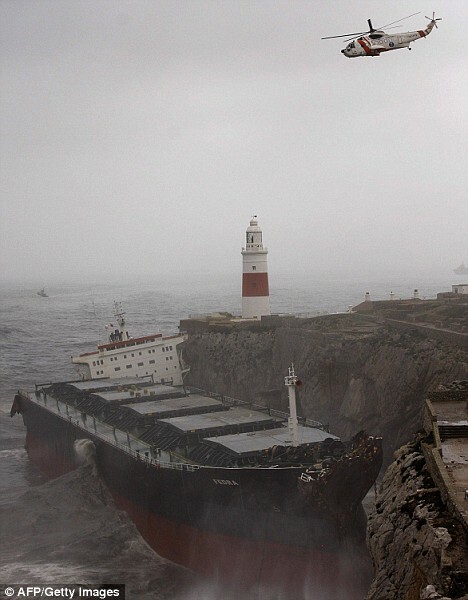 15.10.2008: Two vessels and another 50 people on land took part in a clean-up operation in southern Spain yesterday, after two vessels ran aground last week, spilling oil into the sea. 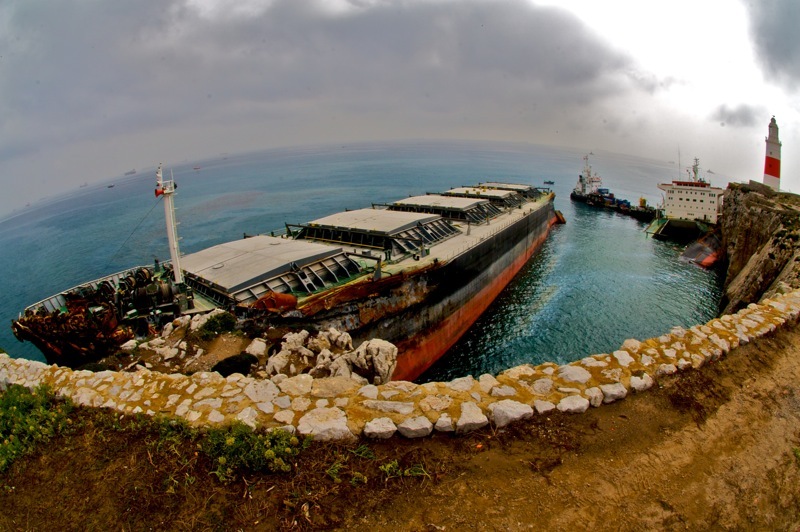 Several tonnes have so far been removed from the waters near the Strait of Gibraltar. Air surveillance show that the oil slicks have become much smaller. 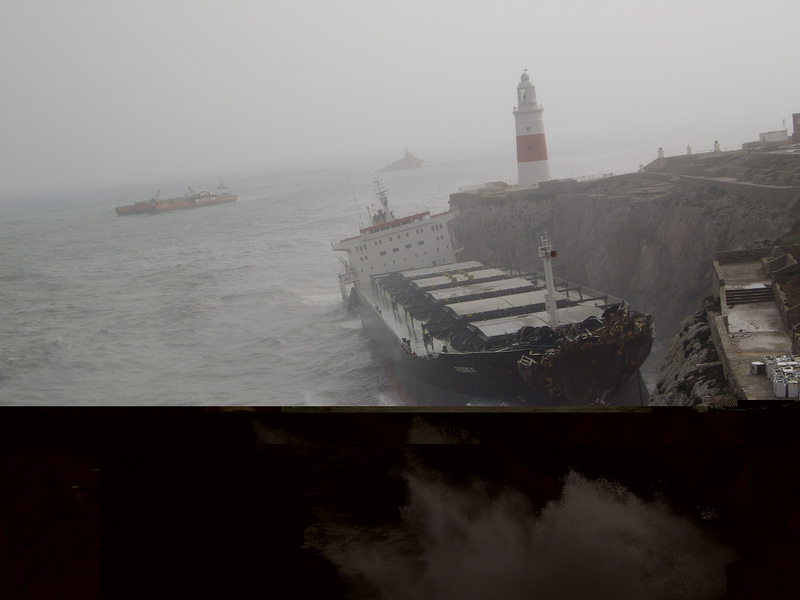 Traces of pollution were spotted off Cueta on Monday. 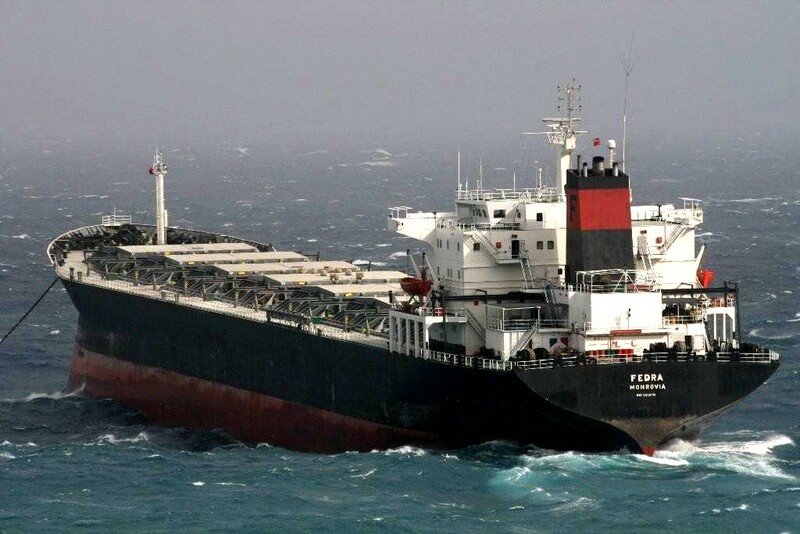 Most of the oil slicks have come from Fedra. 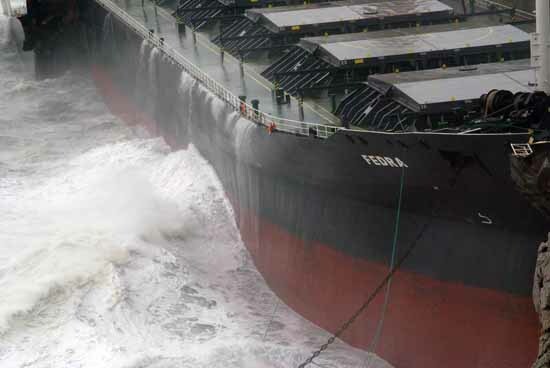 The second vessel, bulk carrier Tawe, which like Fedra ran aground overnight on Friday but in Spanish territory in the Bay of Algeciras, produced less pollution as its spill was quickly stopped. 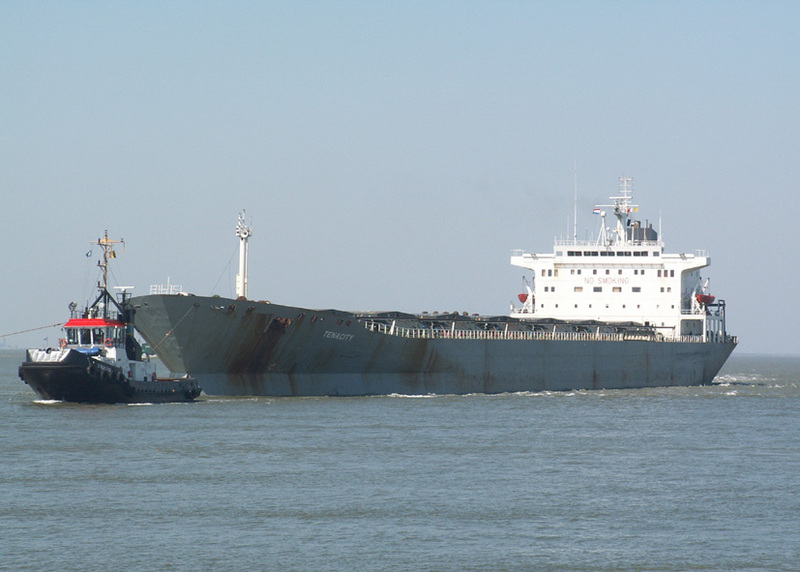 Tawe was carrying 1,000 tonnes of fuel for its own use at the time of the accident. 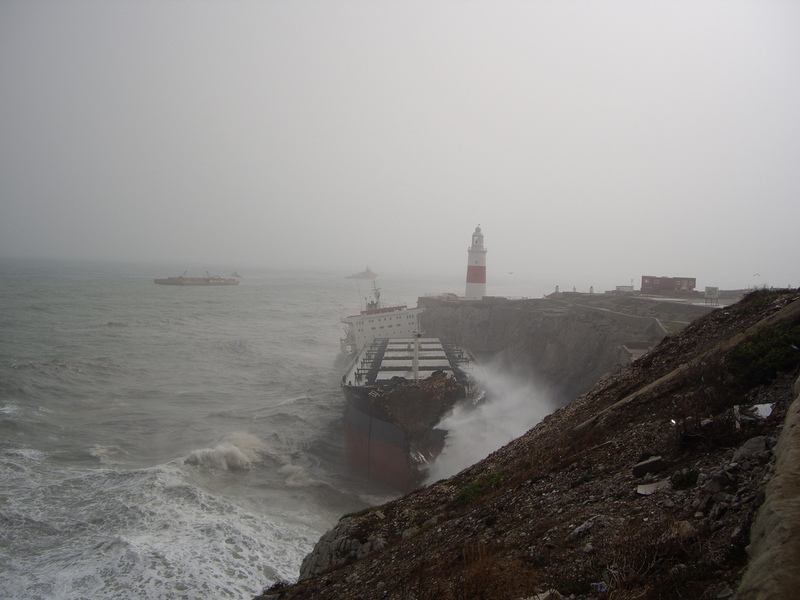 14.10.2008: Three officers from the vessel have been arrested by police in Gibralter. 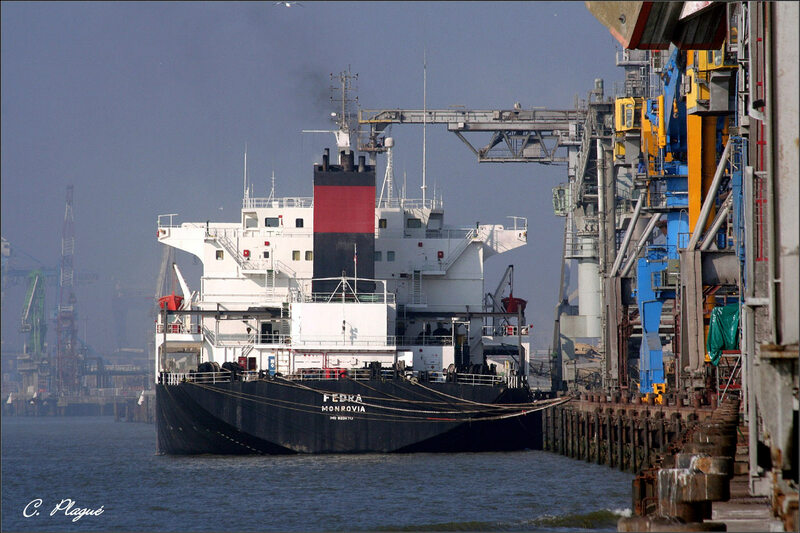 The men were detained on suspicion of contravening port regulations. They have not been charged to date and are on police bail. 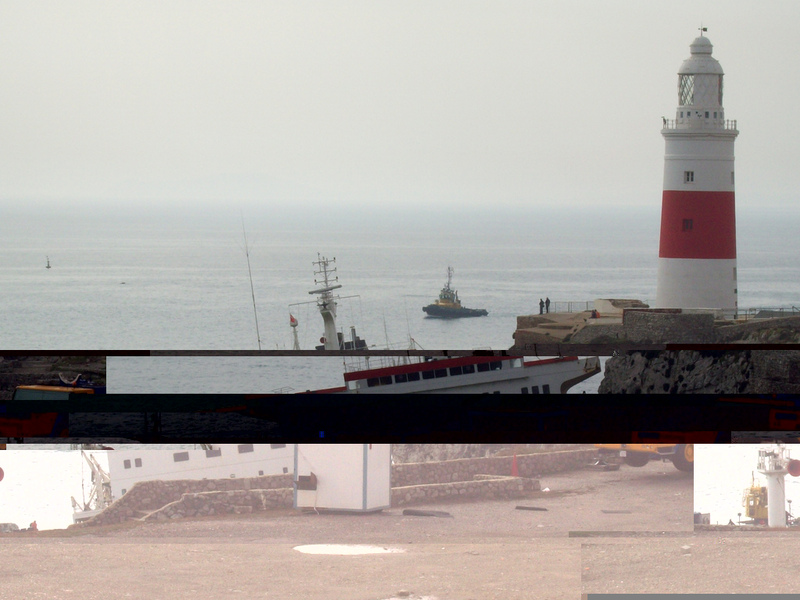 A police investigation is underway and running parallel to a separate investigation by the Gibraltar Maritime Authority, a routine step in cases such as this. 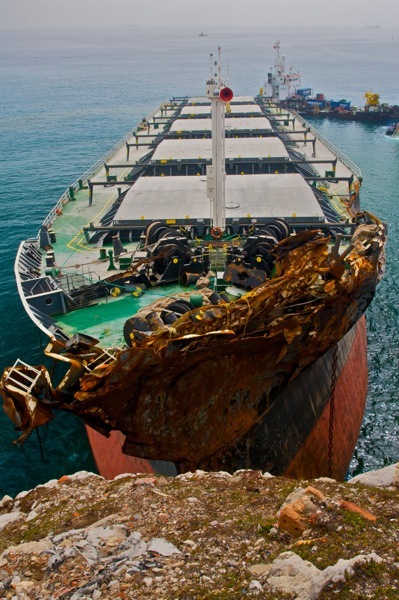 This investigation will examine all technical aspects of the casualty without seeking to apportion blame. 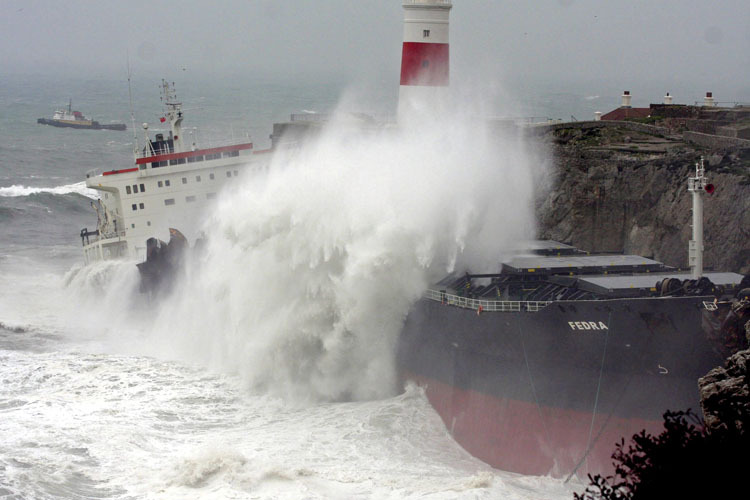 Its aim is to draw lessons from the incident. 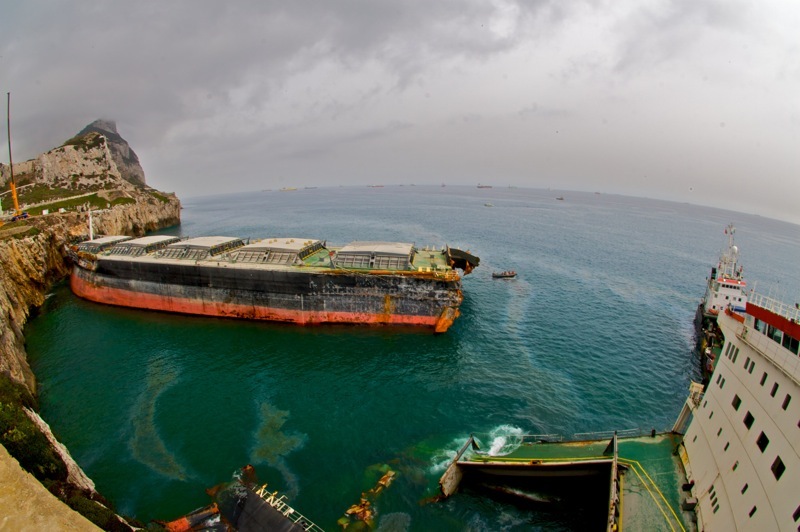 The focus is now on a salvage operation to remove the wreck. 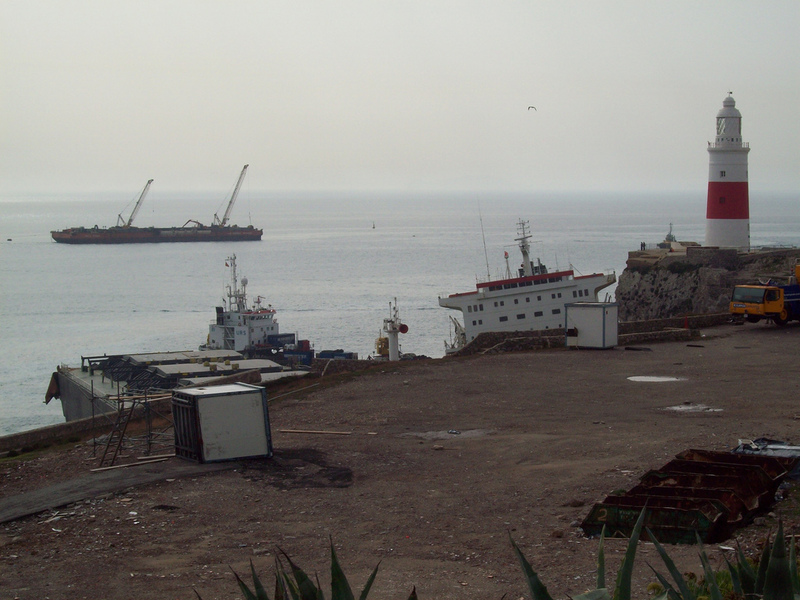 Deux navires ont été mobilisés dans la région d'Algésiras (sud de l'Espagne) pour récupérer le fioul échappé de deux cargos échoués tandis que 50 personnes s'emploient à terre à nettoyer deux plages souillées, a-t-on appris mardi auprès des autorités régionales. 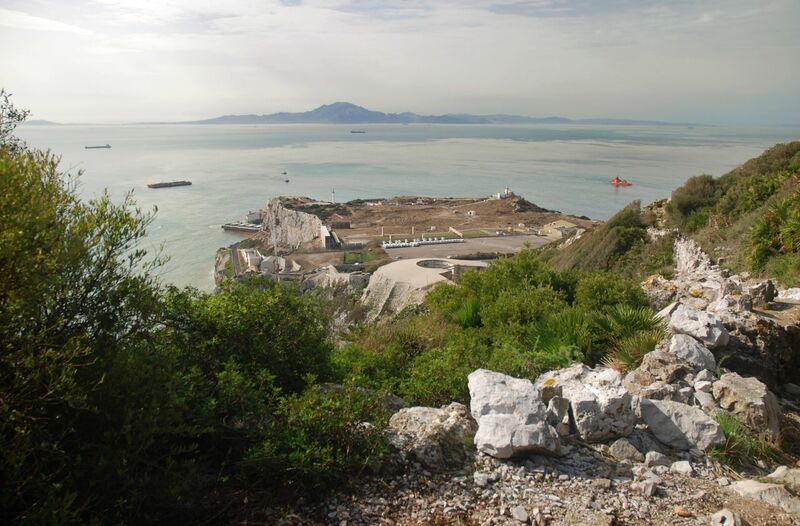 Les quantités de fioul récupérées n'ont pas été précisées mais selon le gouvernement de la colonie britannique de Gibraltar, un des deux cargos qui s'est échoué sur son territoire, a laissé s'échapper environ 150 tonnes d'hydrocarbures. Un navire polyvalent espagnol, le "Clara Campoamor" de la société espagnole de sauvetage en mer Salvamento Maritimo et le "Bahia Tres" navire anti-pollution de l'Agence européenne de sécurité maritime (EMSA) sont à l'oeuvre pour récupérer les nappes de fioul, a indiqué mardi à l'AFP un représentant de Salvamento Maritimo. "Les observations aériennes effectuées ce matin montrent que les nappes (de fioul) ont beaucoup diminué, sont très dispersées et de faible densité", a-t-il précisé. 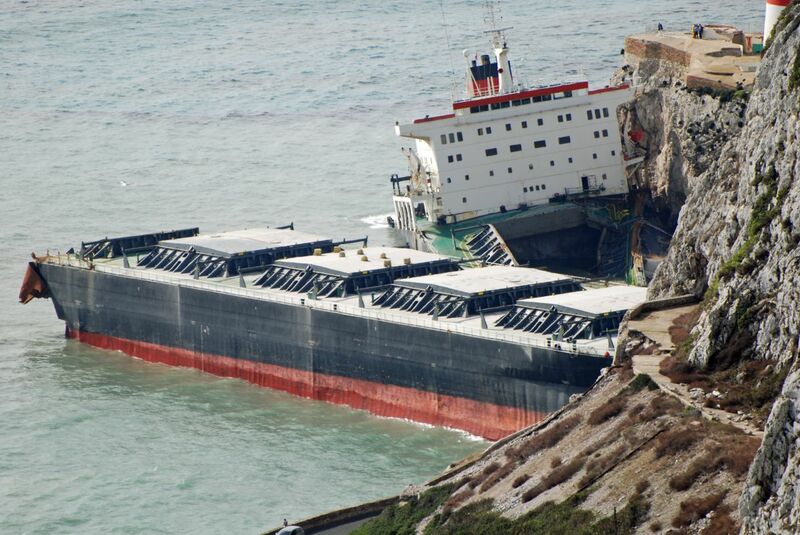 Ces nappes proviennent essentiellement du cargo de transport général "Fedra" qui s'est rompu en deux samedi après s'être échoué sur le territoire de la colonie britannique de Gibraltar. 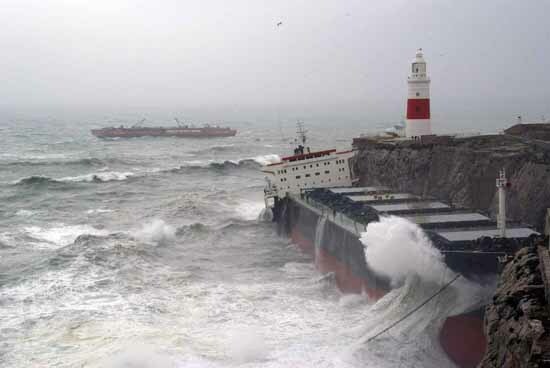 Le gouvernement de Gibraltar avait assuré dimanche que la fuite sur ce navire, avait été stoppée au bout de 24 heures, alors que 150 tonnes de fioul s'étaient répandues en mer. 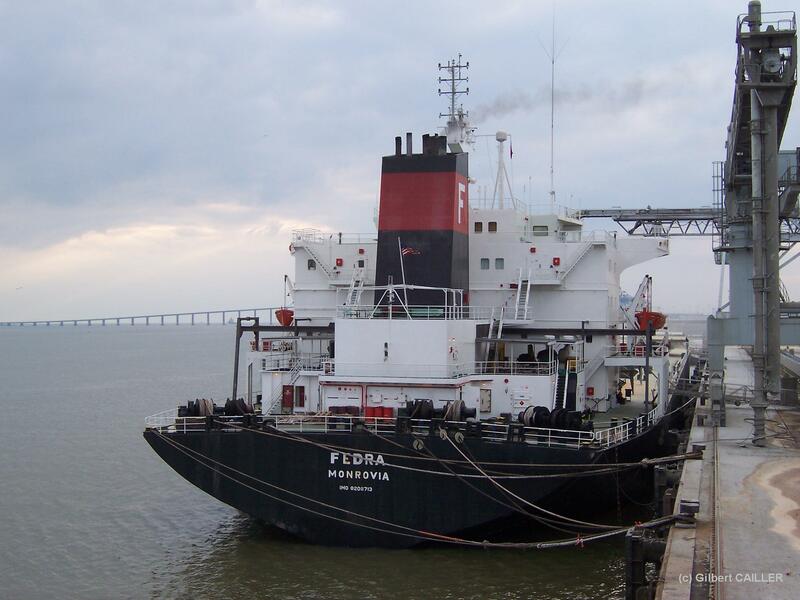 Il avait précisé qu'il procéderait à l'extraction des 150 tonnes de fioul restant dans les réservoirs du cargo mais qu'il ne s'attendait à "aucun événement significatif en matière de pollution". 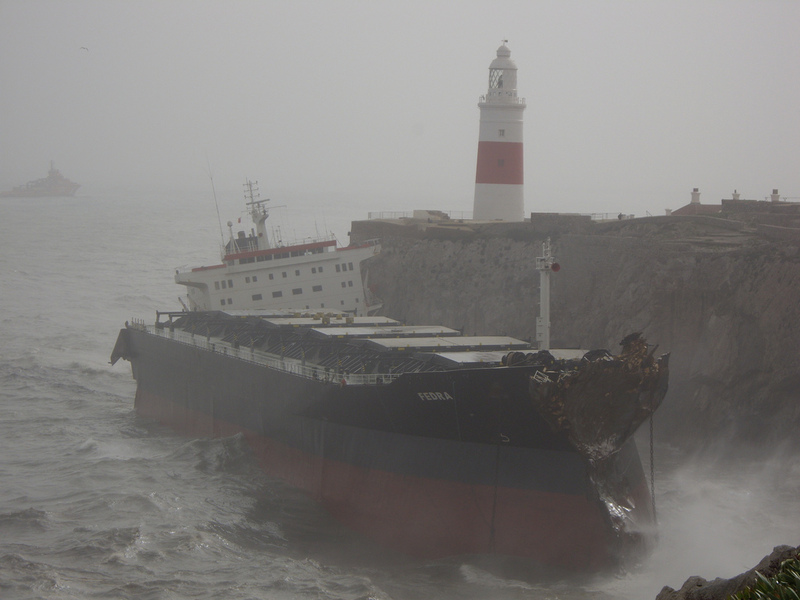 Le "Tawe", deuxième cargo qui s'est échoué dans la nuit de vendredi à samedi en baie d'Algésiras, en territoire espagnol cette fois, a provoqué une pollution de moindre importance, assure Salvamento Maritimo. La récupération du fioul contenu dans les réservoirs de ce dernier est également prévu par Salvamento Maritimo. Le gouvernement régional d'Andalousie a indiqué pour sa part que le fioul avait souillé deux plages, sur les communes de Tarifa et d'Algésiras et que pour l'heure environ 10 mètres cubes de résidus avaient été récupérés par la cinquantaine de personnes affectées au nettoyage. 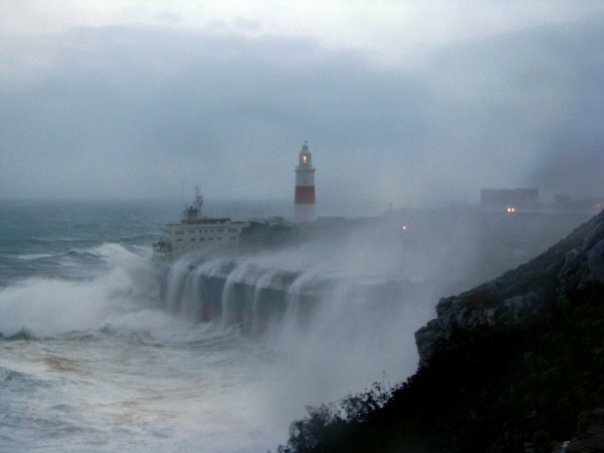 Plusieurs tonnes de fioul, s'échappant de deux cargos échoués au sud de l'Espagne, ont déjà été récupérées par un navire anti-pollution affrété par l'Agence européenne de sécurité maritime (EMSA), a annoncé lundi l'agence dans un communiqué. 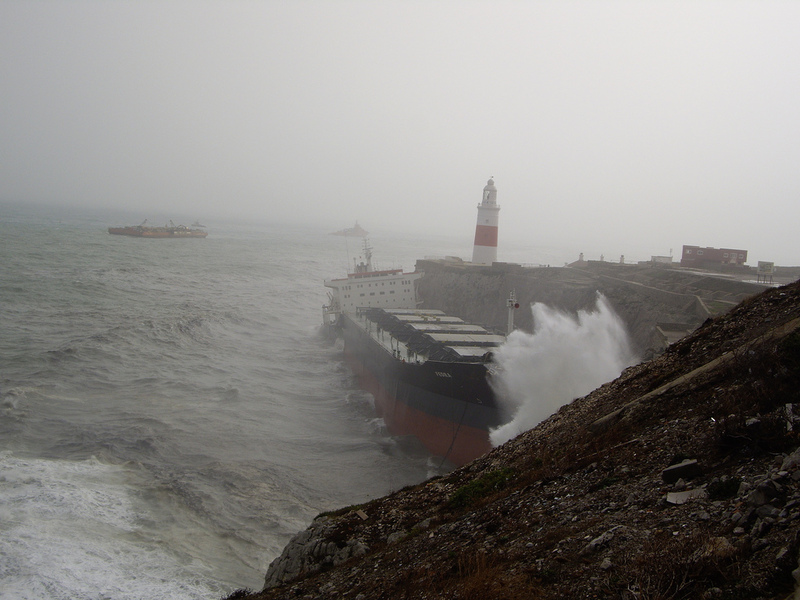 L'EMSA, basée à Lisbonne, avait reçu vendredi soir une demande d'assistance de la part des autorités espagnoles après l'échouage de deux cargos, entre l'Espagne et Gibraltar, et décidé d'affréter le Bahia Tres, un pétrolier opérant dans la baie d'Algésiras transformé en quelques heures en navire anti-pollution. Depuis dimanche, le Bahia Tres "localise les nappes de carburant et, plus important, les recueille partout où c'est possible. 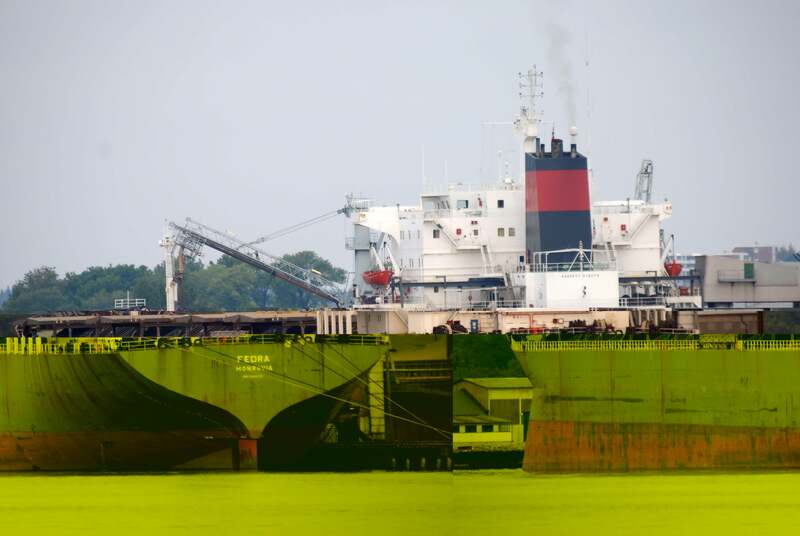 Plusieurs tonnes de pétrole ont déjà été ramassées", a ajouté l'EMSA qui fournit simultanément aux autorités espagnoles des images satellite obtenues par le système européen de détection des nappes pétrolières CleanSeaNet. "Le Bahia Tres restera sur place aussi longtemps que les autorités espagnoles le souhaiteront", a précisé à l'AFP Louis Baumard, chargé de communication à l'EMSA. 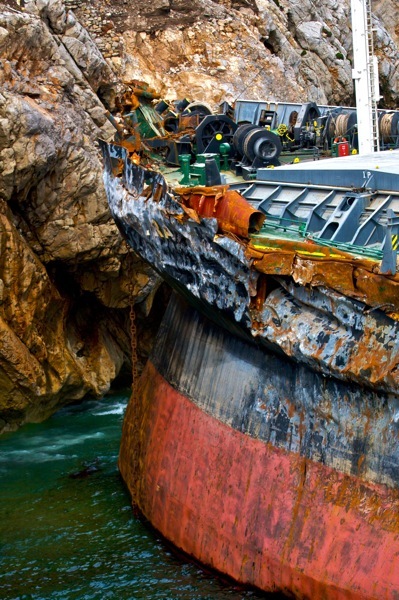 "La catastrophe a été évitée car ces navires navigaient à vide, ne transportant que du carburant de propulsion. 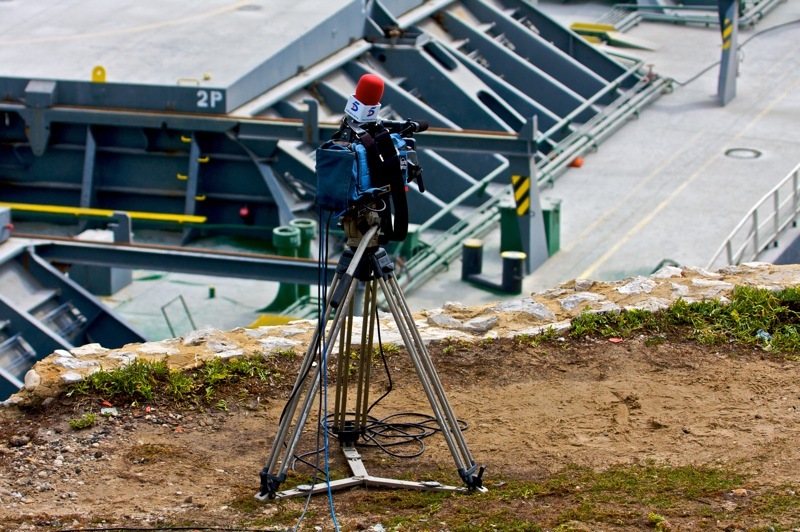 Gibraltar, et même l'Espagne, ont eu beaucoup de chances", a-t-il souligné. 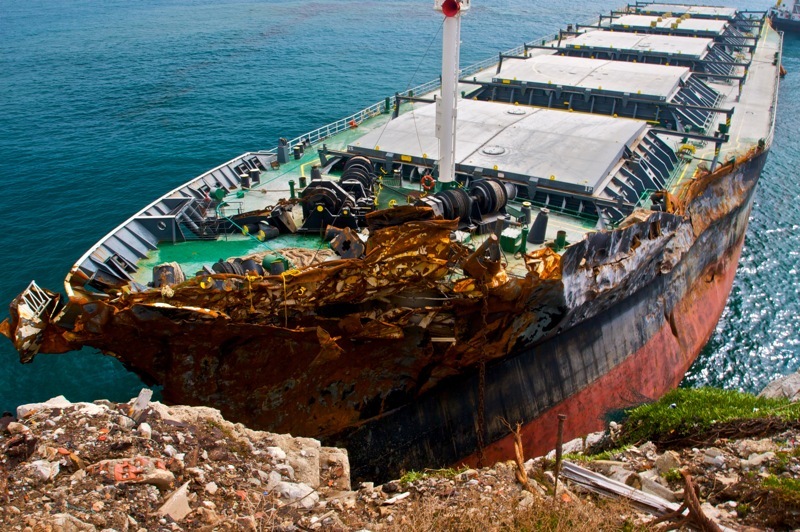 Depuis 2005, l'EMSA dispose d'une flotte de navires répartis le long des côtes européennes et pouvant intervenir en cas de marée noire à la demande des Etats-membres. Ce dispositif compte actuellement 13 bateaux et devraient bientôt être étendu jusqu'à la Baltique et la Mer noire. 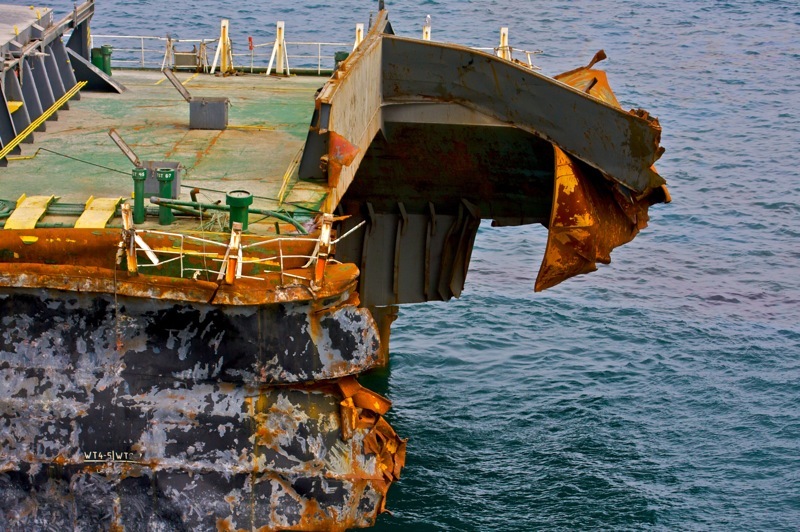 THE grounding of two ships off Spain has given the European Maritime Safety Agency another chance to put its emergency oil response system into operation. 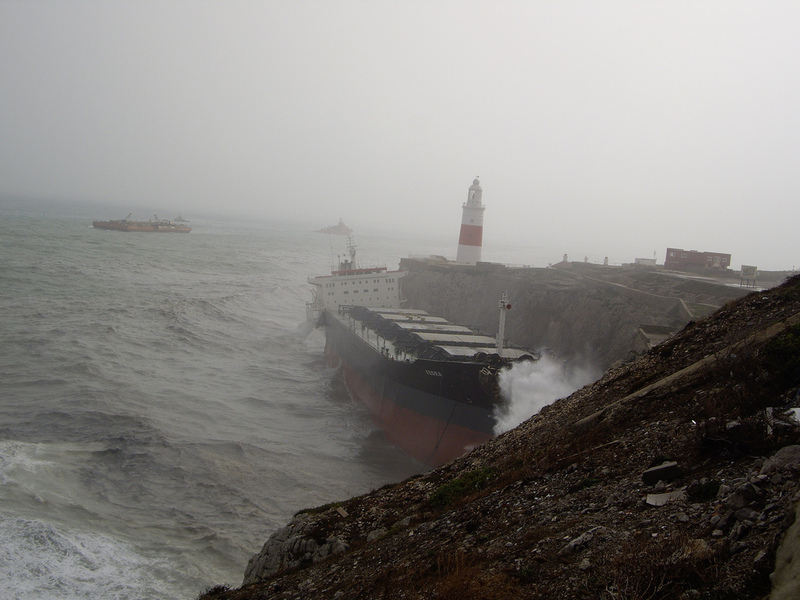 After a request from Madrid, the Lisbon-based agency sent the Bahia Tres, normally operated by Mureoil in the Bay of Algeciras, to assist in the clean-up and spill prevention operation, recovering oil patches with its on-board slick detection system and recovering “a number of tons of oil.” The agency also puts is CleanSeaNet satellite oil slick detection system into operation. 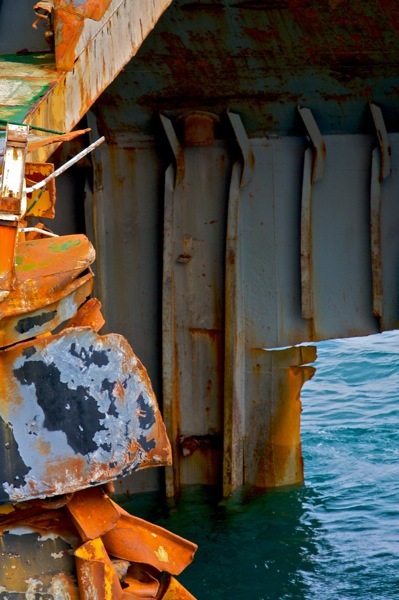 ”Although there are hundreds of accidents involving commercial ships in EU waters every year, it is a very unusual situation when two such large vessels run aground and spill oil at the same time,” said Emsa executive director Willem de Ruiter. 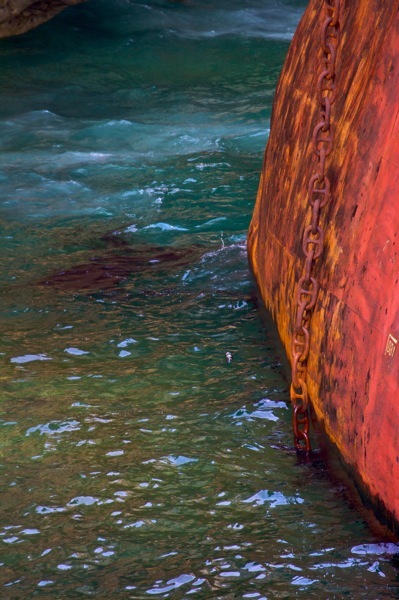 “This really shows the benefits of our recent build-up of a network of oil pollution response vessels around the EU coastline.” The Emsa network of stand-by ships has grown to a fleet of 13 covering coastline from the Baltic to the Black Sea. 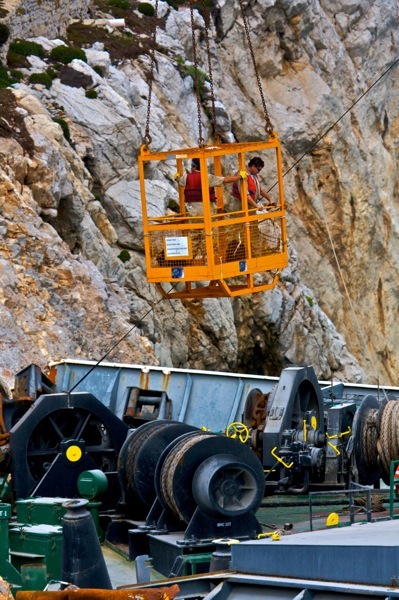 The network covered has gradually been extended over several years, following tenders. 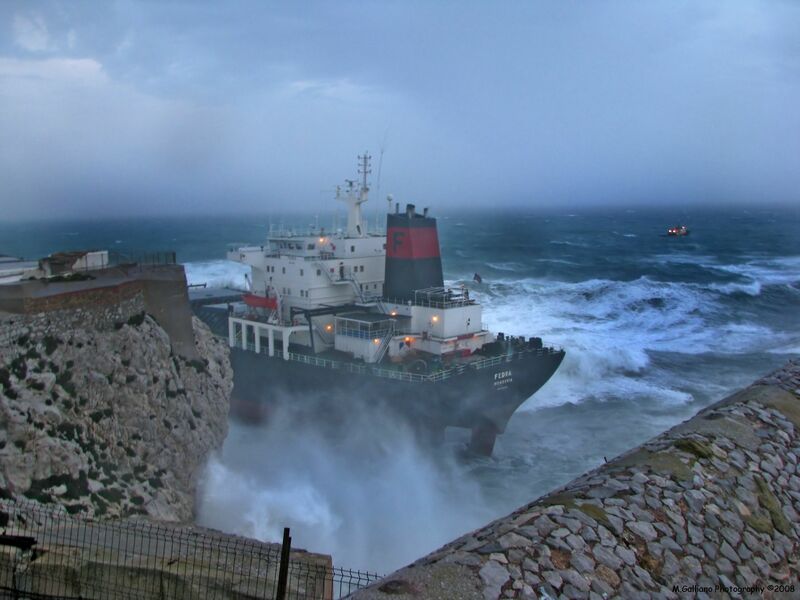 There was no nearby Emsa vessel on the last occasion Spain called upon Emsa, which meant a ship had to be sent from Malta. It took a week to arrive. 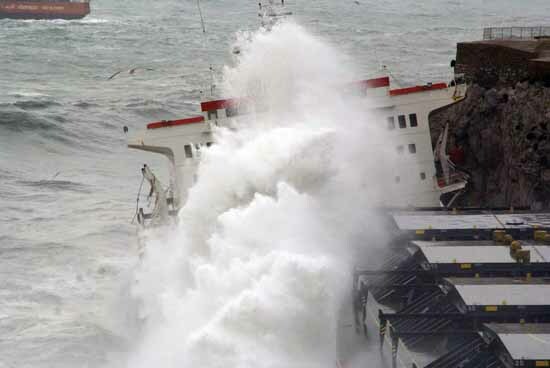 Ships in the stand-by Emsa fleet go about their business but must be ready to operation on behalf of the EU at short notice. 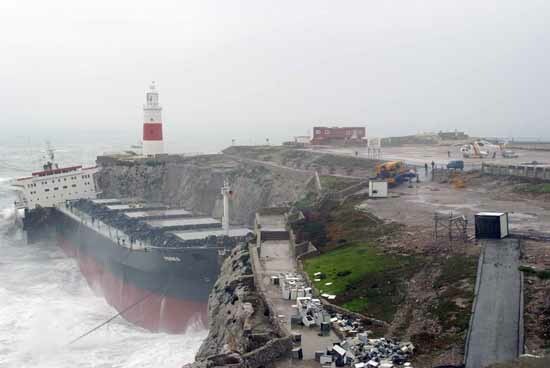 Heavy weather caused the bulk carrier Fedra to run aground off Gibralat last Friday. 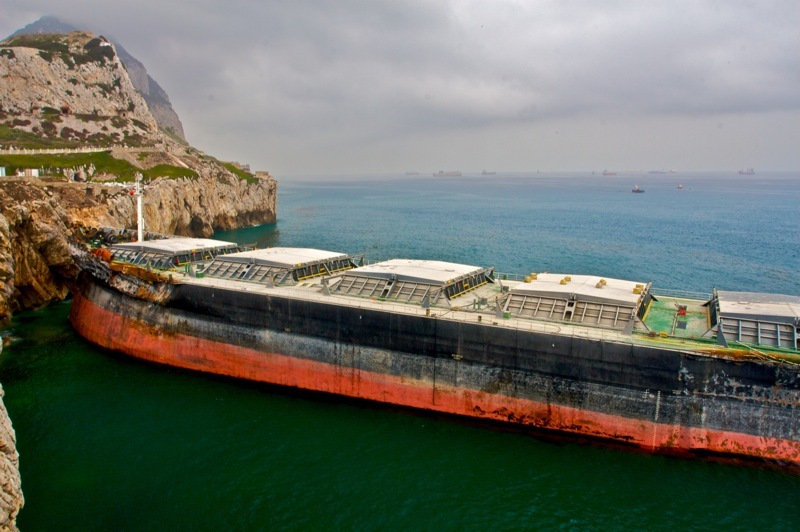 Several hours later, another bulk carrier, the Tawe ran aground near the port of Algeciras. 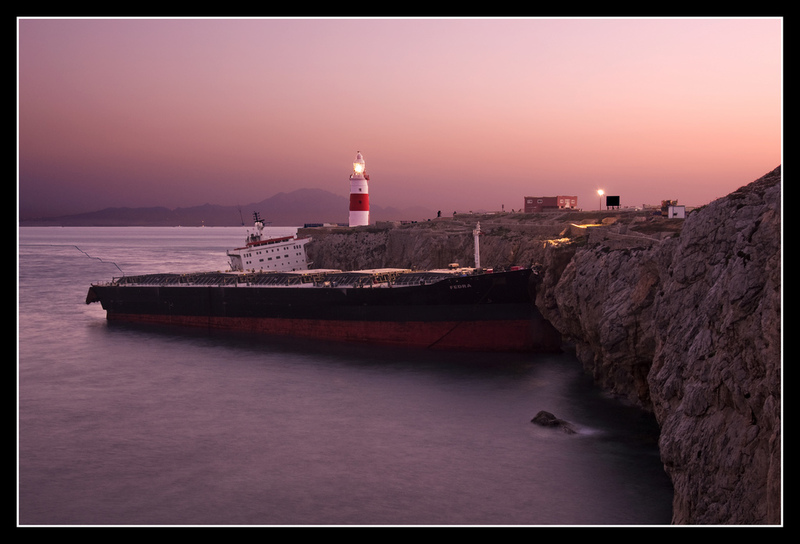 THE crew of a cargo ship that ran aground in Gibraltar was plucked to safety in a perilous nighttime rescue by Gibraltarian and Spanish emergency services last Friday. 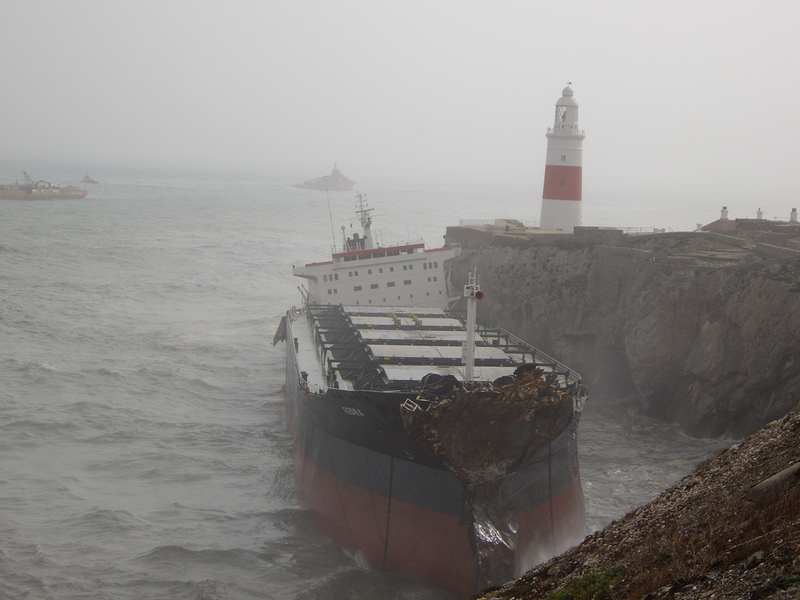 Defying extreme gale force winds, a Spanish maritime rescue helicopter airlifted five men from the bow of the 24-year old bulk carrier Fedra as it lay pinned by pounding waves at the base of sheers cliffs in Europa Point. 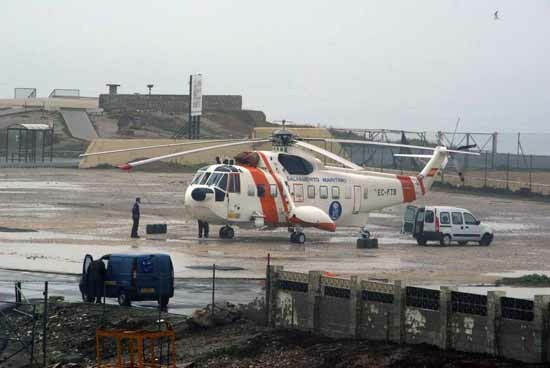 But the savage weather played havoc with the helicopter’s engine, forcing the pilot to make an emergency landing and leaving teams on land to find another way of getting the men off the ship. 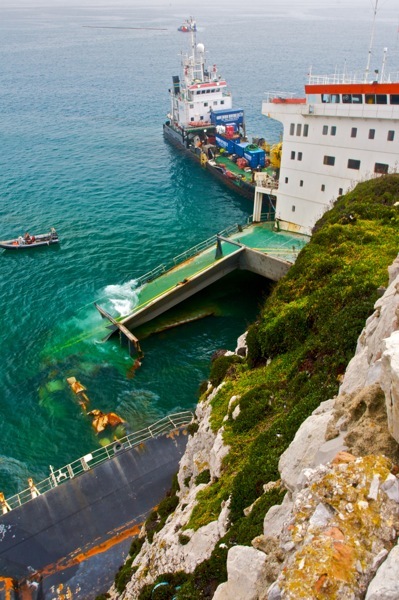 Using a crane positioned on the cliff edge above the bow, Gibraltarian rescuers rigged a cradle that was lowered to the seafarers below. In small groups throughout the night, they were hauled up wet, shivering and terrified. 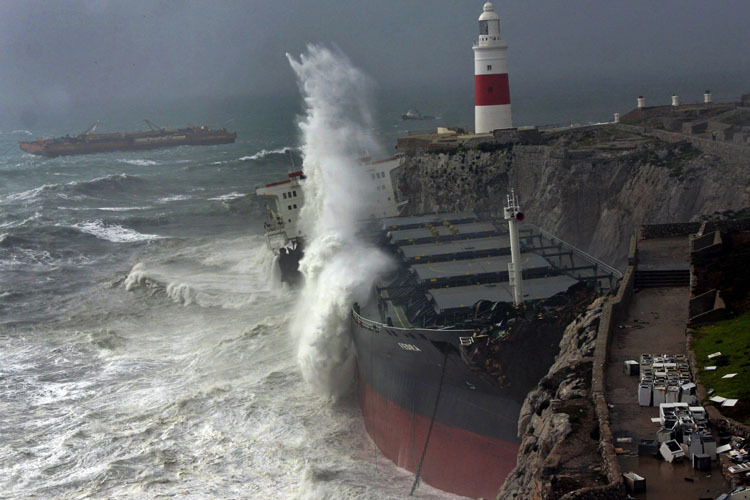 At one point, with 11 men still on board, the operation had to be suspended as the storm intensified. 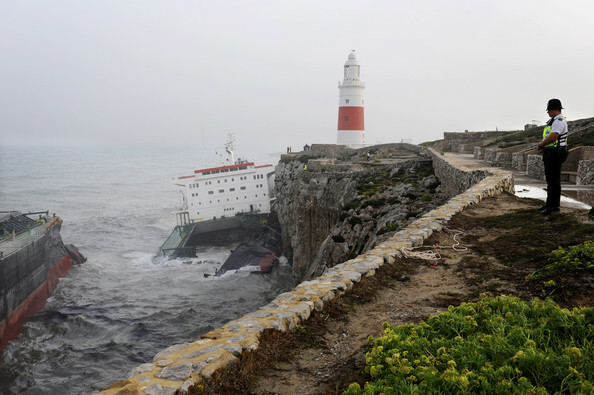 "We thought we were going to lose them," said one exhausted rescuer. 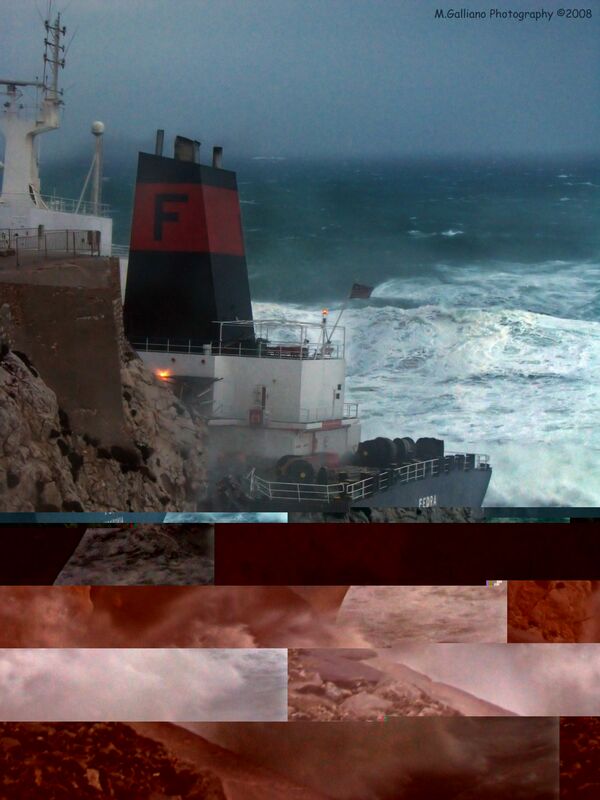 "But at around 7am, we had a small weather window." "We knew this was the only chance they had." 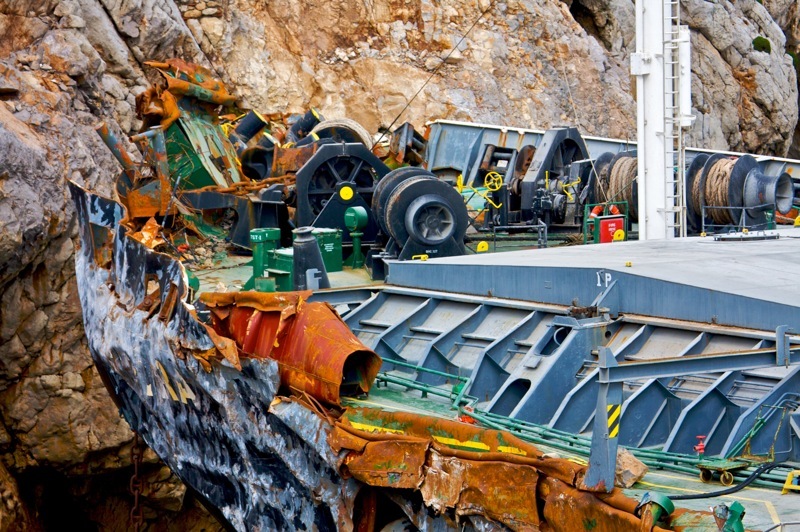 In a dramatic end to the operation, all remaining 11 men were winched to safety in one hoist. 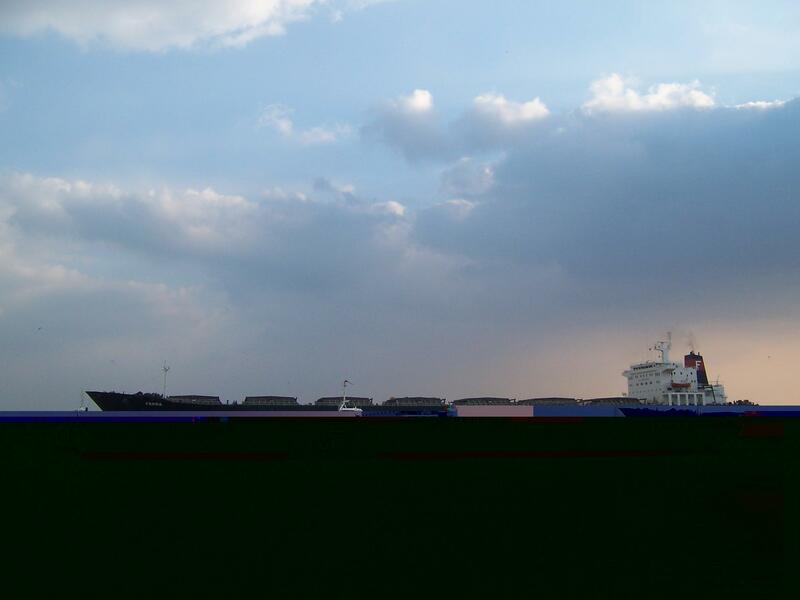 The men, mostly Filipino sailors, were treated in hospital but were later released and taken to a local hotel. 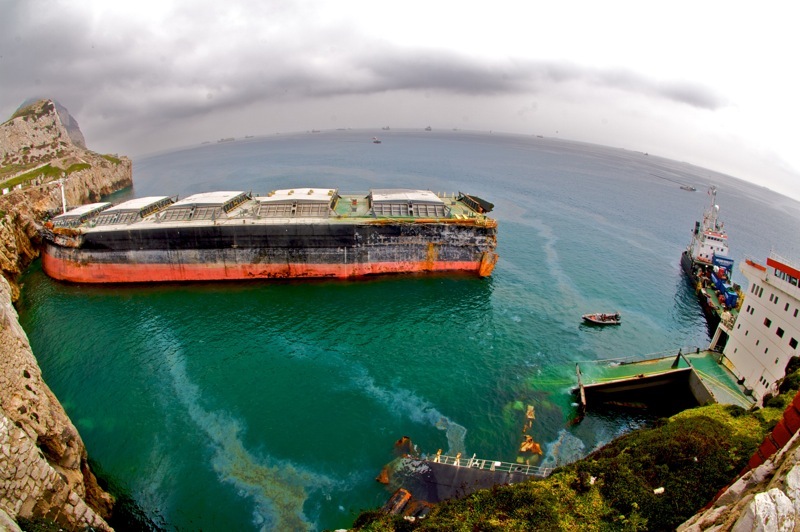 By mid Saturday morning the Liberian-flag Fedra had been ripped apart by the sea, the vessel torn in two close to the accommodation block. 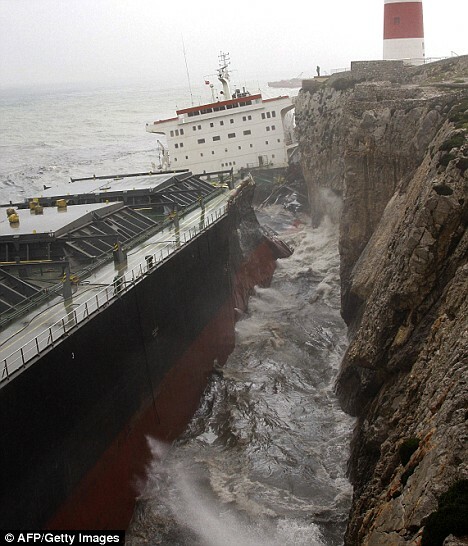 Both sections of the ship remained trapped against the cliffs, heaving and hammering violently in the pitching seas. 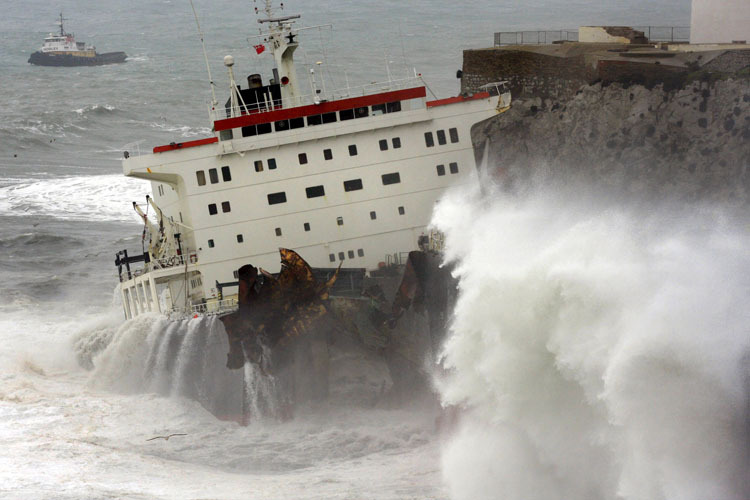 The Fedra was one of two weekend casualties in this region, which was battered by a force 11 gale for much of Friday and Saturday. 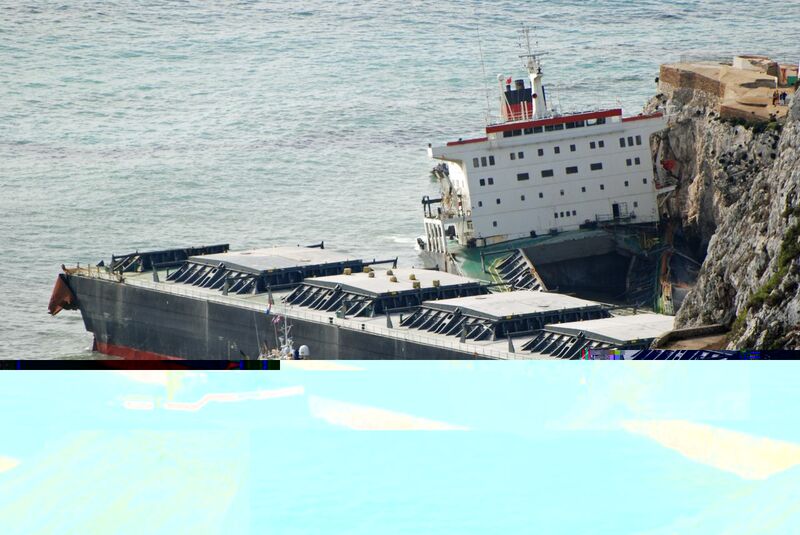 In nearby Algeciras, the Liberian-flag bulk carrier Tawe ran aground and sustained hull damage, leaking fuel oil onto nearby beaches. 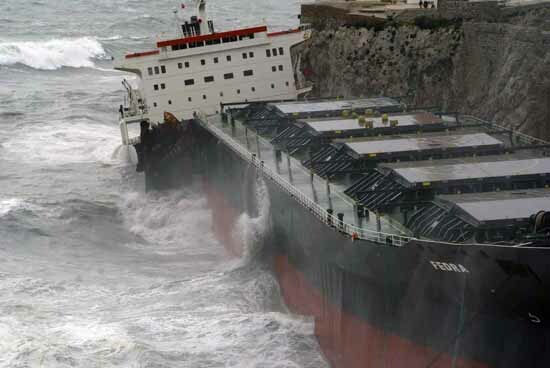 There were 22 seafarers on board but tugs were in assistance and the situation appeared stable. 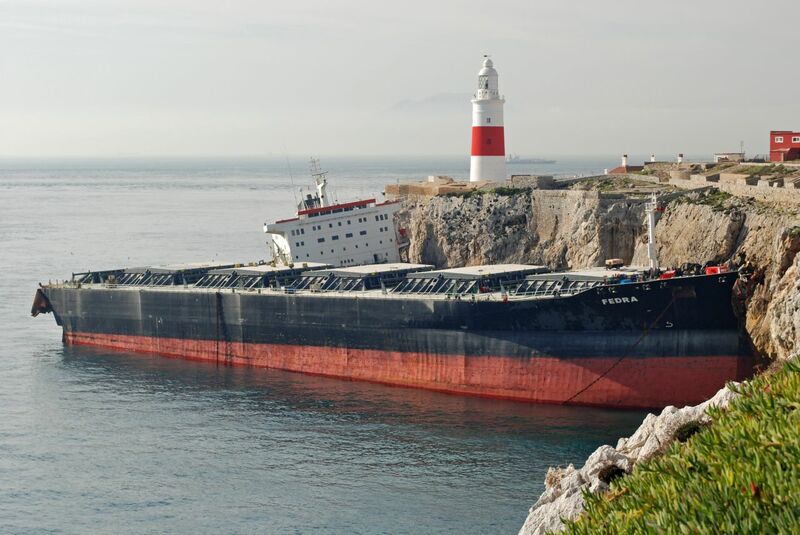 Over in Gibraltar, the focus now is on a salvage operation to remove the wreck of the Fedra, which could pose a danger to navigation if either section breaks free of the rocks. 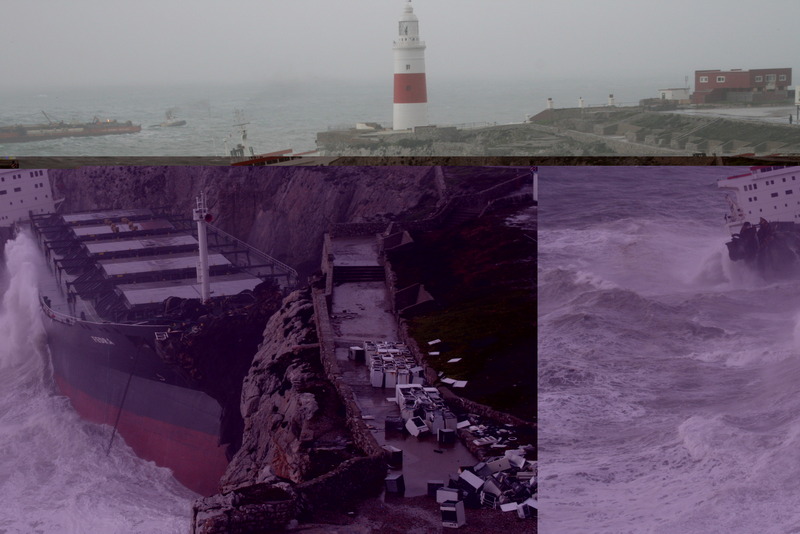 But no action is likely until after the weekend, when the weather is expected to ease significantly. 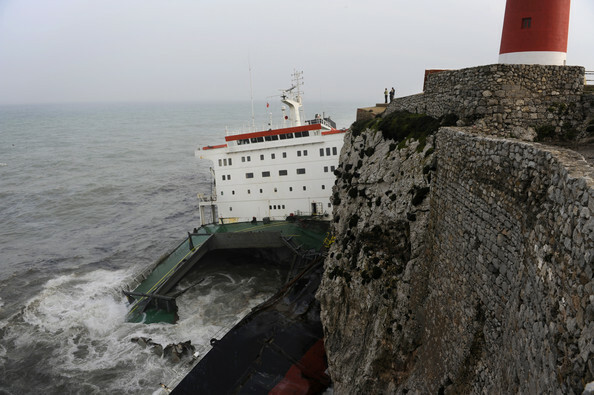 The Fedra ran aground after suffering engine failure on Friday morning and dragging its anchor until it came perilously close to the shore. 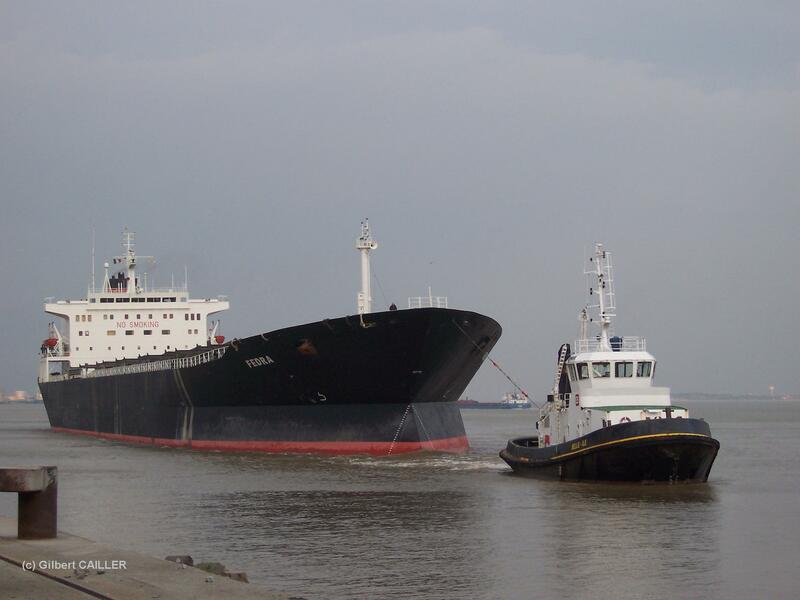 All through Friday afternoon, tugs laboured to secure towlines to the crippled vessel but these repeatedly failed. 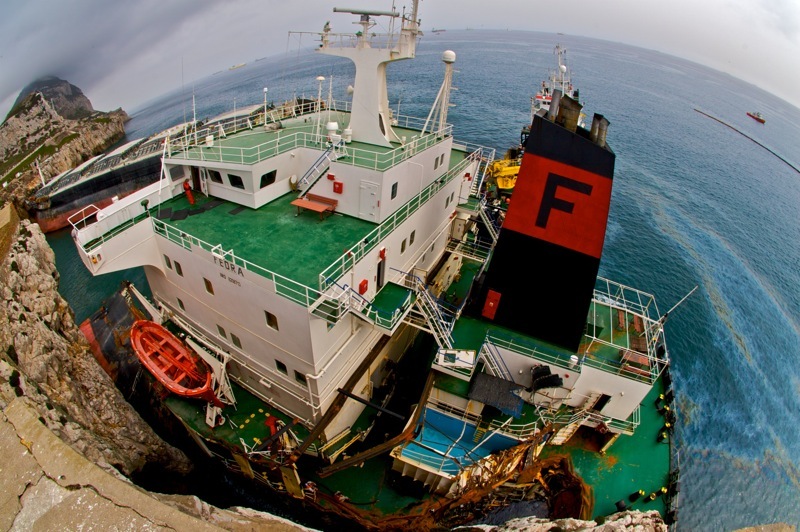 Efforts to repair the ship’s engine also proved futile. 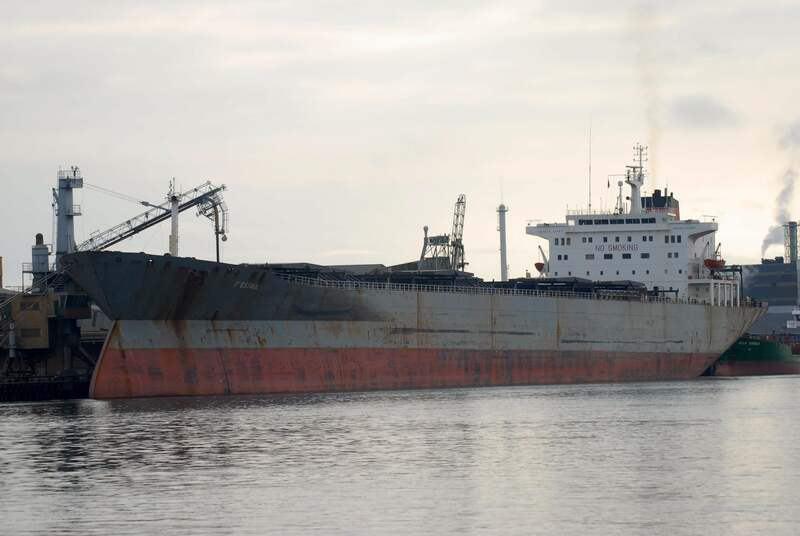 The 36,000-tonne ship was empty at the time of the casualty and is believed to be carrying only a small amount of fuel for its own consumption. 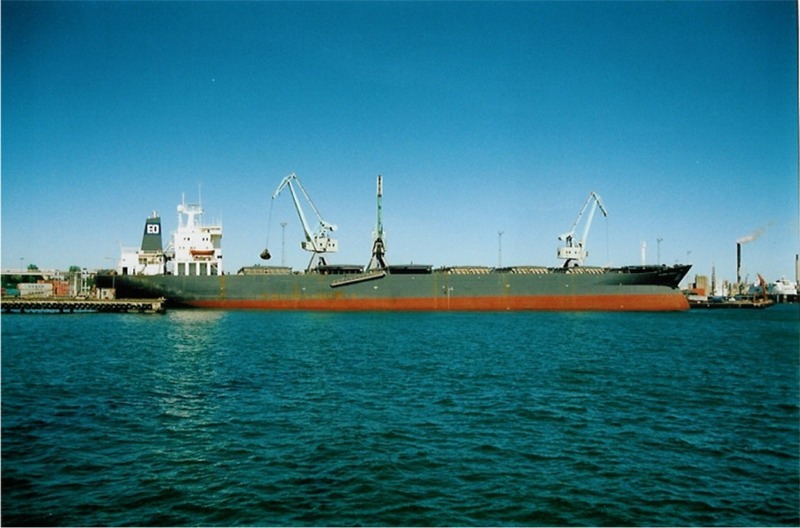 According to the EU shipping database Equasis, it is managed by the Greek company Dilek Shipping. 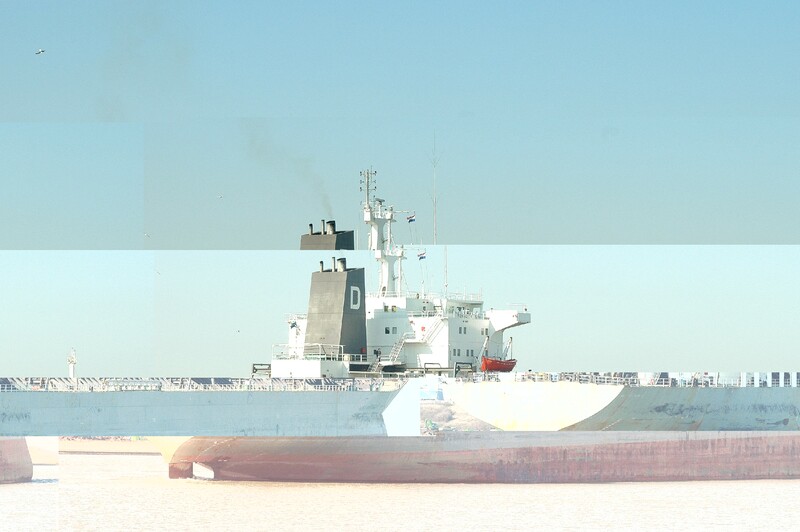 The ship has a chequered port state control background and was last detained in August by Chinese inspectors who found 18 deficiencies, including three retaing to its propulsion systems. 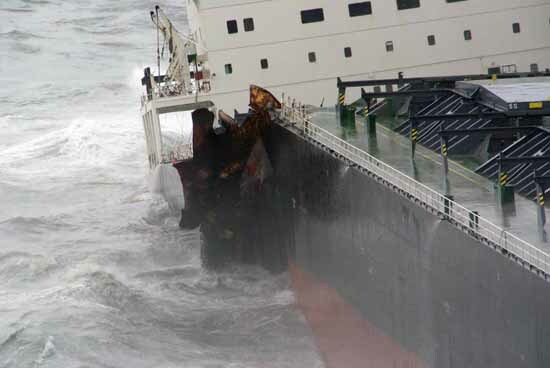 The grounding, which happened just metres from where the New Flame foundered just over a year ago, will once again renew calls for tighter controls on shipping in the area. Reported to have suffered engine problems and grounded on rocks at entrance of Gibraltar port. NB : All the Information mentioned in this page are extracted from public and free access web sites or papers, magazines, etc. Our sources are mentioned. If any problem, please contact the webmaster.